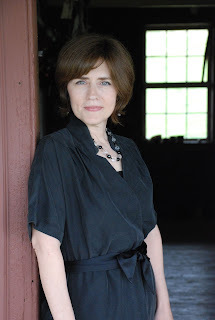 HALLIE EPHRON: Today we're happy to welcome Mollie Cox Bryan to Jungle Red. 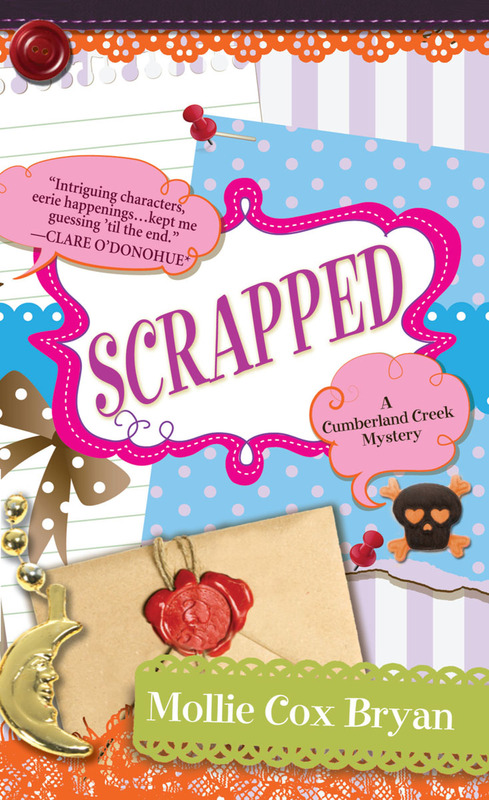 Her second Cumberland Creek mystery Scrapped is just out. It's got plenty of down home fun, secrets, murder, and a splash of the supernatural. 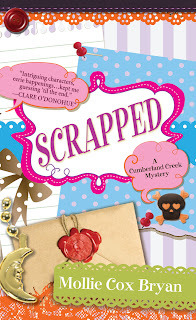 A new character, Cookie Crandall, makes friends with fellow scrap bookers. A self-proclaimed witch, Cookie rhapsodizes about runes and moon phases. 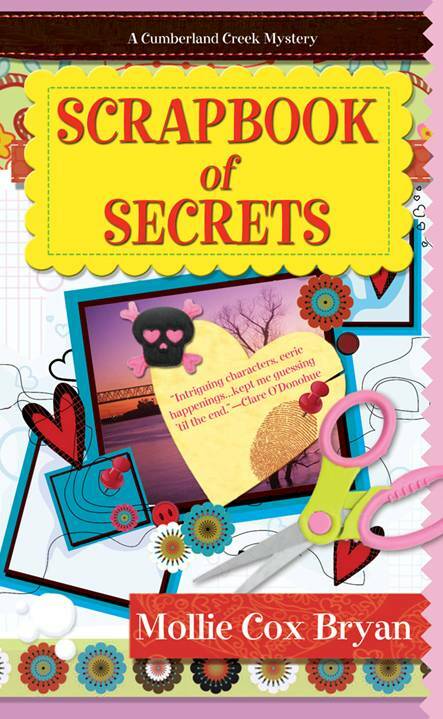 She becomes the prime suspect in a series of bizarre murder, and even her new friends begin to doubt her innocence when they find an ornate, spiritual scrapbook that an alleged beginner like Cookie could never have crafted. I love stories that mix a little supernatural with the natural, and then let the reader puzzle it out. Sounds like you do, too, Mollie. MOLLIE COX BRYAN: I have a confession. A lifelong obsession—with the paranormal. But it's not the kind of obsession in which I read every paranormal book I can get my hands on and write about werewolves and vampires. (Though I might do that some day. I never say never.) But for now, my obsession lingers on the moment of wonder. HALLIE: Like when someone says, "Did you see that?" MOLLIE: Right! And you did not see it, but you get the goose pimples because you know the person next to you did. So much about this life that’s enjoyable is unexplainable. The pull you feel to study engineering, your longing to live in a certain part of the world, or the time you’re walking down the street of a huge city and your eyes suddenly find another person’s and you just suddenly know, in the midst of the crowd, that this person will have some meaning in your life. Maybe you can explain some things, but this? Nah. HALLIE: And how can you tell if it's supernatural or natural? MOLLIE: I find it curious that the paranormal really cannot be proven. I know about the paranormal investigators and so on and even watch some of those shows. But I never see or hear what they are talking about. (Did you hear that?” says the investigator. “No,” I usually reply.) And when I do hear the noise, there’s an explanation—mice, a weird air current in the room, and so on. But. When things like this happen to you, you don’t need proof, do you? HALLIE: That's the fun of it. MOLLIE: I dig the unexplainable. This is why I use the paranormal in my books. 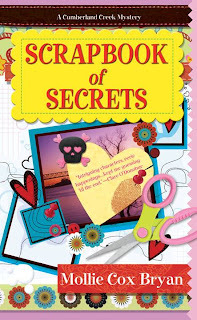 I’ve been asked about the paranormal element in my first book SCRAPBOOK OF SECRETS. Is Bea’s husband really haunting her? Or does she just miss him so much that she imagines him? And if that’s the case—how powerful is this thing we call imagination? Can it make something seem so real that we actually wield it into existence? I wonder. HALLIE: Love that question: Is it real? Because, you know, it's fiction! MOLLIE: I think it's great fodder for fiction. Conversations with our loved ones that have died? How many of us do that? I know when I run across something my Gram might have thought funny, or am working on a recipe that she gave, me, I have a little conversation with her. Am I they only person who does this? In SCRAPPED, my new character, Cookie Crandall, is a practicing witch, yet she doesn't talk to ghosts and/or welcome vampires in her life. She’s more about the everyday kind of witch that might be living in your neighborhood. So while there's a miniscule amount of paranormal elements in my books, it's in each one so far, the focus is on the everyday paranormal. The kind that leaves you wondering: did I just see a ghost? Have I been here before? HALLIE: So, Reds, here's Mollie's question: As readers, how do you feel about that when you're reading? Do you want hard cold answers? Or is okay to leave some unanswered questions? I'm a bit more in the skeptics camp on this one. Though I love using the POSSIBILITY (so tantalizing!) in my books. In my first novel the main character drinks a glass of wine, thinks about his dead wife, falls asleep on the couch and dreams that she's there with him. When he wakes up, there are TWO empty wine glasses on the coffee table. I'm a skeptic, but a massive amount of personal experience has me thinking I'm crazy to maintain that opinion. In fiction, I can usually tell if the author writes from personal experience. One without such would need to do a lot of research. I was going to say I don't do paranormal, but then how to explain the Tarot card reader in the Key West books? I interviewed the man who actually reads cards at the sunset celebration in KW--what he said made so so much sense. Very hard to dismiss all of it, even for a skeptic:). Thanks all for commenting. I agree with you, Joan, it takes a deft hand to pull it off well. No out of left field magical developments for me. I love playing with the possibilities, Hallie! Yes. I know a lot of real witches, those that practice Wicca. It helped me a lot with this book. I based Cookie on several women I know. Yes, it's from AMNESIA, the first Peter Zak mystery - it's at the end. Mollie, I want to know, too - did you base the 'witch' character on anyone you've met? Mollie: Really? Wondering, do they consider Wicca 'paranormal'? Probably not, Hallie. It's a religion--but it is a religion that uses "magic" and "ritual" in ways that OTHER folks might consider paranormal. Cookie, the character in my book, is an every day witch. She doesn't have any special "paranormal gifts." But she is intellectually gifted in math, science, and physics. Oh, I competely believe in thinks we dont understand. ESP? One hundred per cent. But in books? Yeah, I agree, Joan. Sometimes even typos can be tellink. Seems to be a lesson I learn again and again. Not sure if I'd call it ESP, Hank. But listening to my intuition is something that I'm finally learning to do. I tend to prefer my reading to fall in either the paranormal or more reality based "worlds", not a mixture of the two. But I do think that a little bit of unexplained activity (as Mollie talks about) is not necessarily a deal-breaker. We have certainly all experienced things that we can't exactly explain. It seems completely realistic to me that a local witch (Wiccan) would stop by the scrapbook store, so I am looking forward to reading this second book in the series. I was a huge fan of the first book, so I excited to see where Mollie takes us this time out. I've dabbled in the "unexplained" in a couple of my books, and have always left it open to interpretation. But there is so much that we don't understand, and I think everyone experiences those little moments. Your books are going on my list! Thanks so much for commenting Kristopher and Deb--and for such kind words. Happy New Year! You know, I really don't care if there are questions that have no answers! There was a time when I would have said "oh, no, I would never read anything the least bit paranormal!" I slowly slipped into it after getting addicted to Buffy the Vampire Slayer! As children,nearly all of us accepted fairy tales,we accepted stories about talking animals - I still love all the Dr Seuss stories -and a lot of us enjoy science fiction. If something is well-written I don't care if it's mystery or fairy tale or fantasy or science fiction or paranormal, or even plain old literary fiction. And I'd have told you I wouldn't like a book with an animal as narrator, yet I'm a big fan of Spencer Quinn's books. Bernie is such a great character I forgive him for being a dog. I don't mind loose ends one bit, and I am fascinated by the paranormal. I have been to Lily Dale, NY once and Cassadaga in Florida twice -- fascinated by the spiritualists who accept so much that they cannot "know." I have not, however, been drawn to the vampire/fantasy world. I prefer magic as part of everyday reality. I just love the description of this book! Did she do it? Having read Mollie's other books I know that she likes to take things right to the edge. Cookie seems like a fascinating character and the idea of a scrapbook loaded with secrets (spells? magic?) totally snags my interest as a reader. I have cats with paranormal abilities in my series so obviously I don't have a problem with that kind of thing in books. In real life I tend to be more of a skeptic. Having owned cats, I don't have to stretch much to believe they have active inner lives. Thanks, Denise. Sounds like fascinating travels. Glad to know Cookie snagged you, Kettle. I have a fondness for her. Mollie and Hallie, very nice blog today and lots of fun! One of the Harvard divinity students I supervised at her field education site was a witch, and Pagan, but not Wiccan. Another was Wiccan and not a witch. The difference is Wicca is a religion, and many religious Wiccans are opposed to the practice of magic. While most witches are Pagan, some are not. Mollie, I love the idea of having your witch a practitioner of the everyday kind of magic. And I don't think you have to have answers to everything--as long as no plot points are determined by some magical power from left field. I'll have to look up your books now, for sure. Reine,yes there are so many different kinds of spiritual practices (and label) that fall under that "umbrella." I know many Wiccan and Pagans that will not use the word "witch"to describe themselves at all.